Perfectly one of a kind! 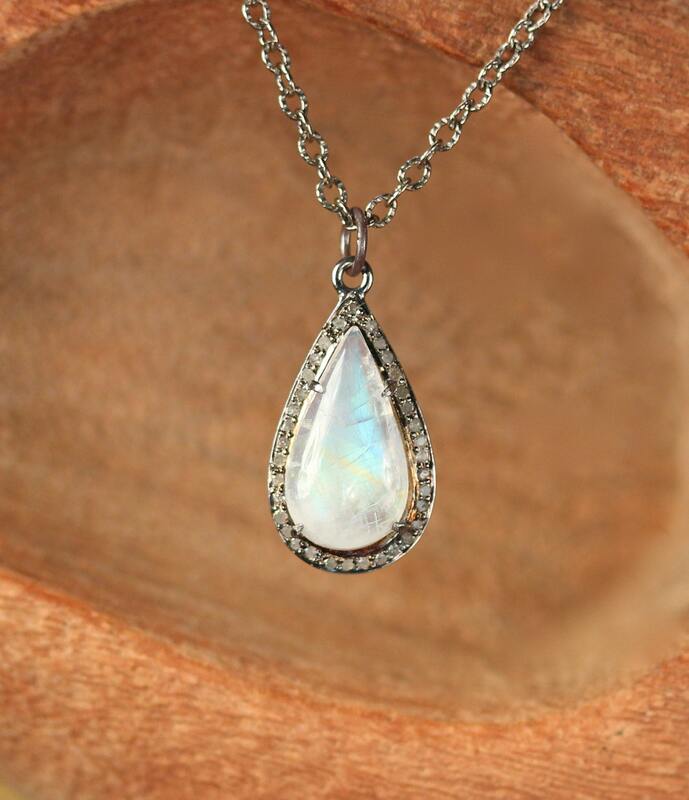 34 tiny diamonds surrounding a stunning, prong set rainbow moonstone cabochon, hanging from a 16 inch oxidized sterling silver chain. 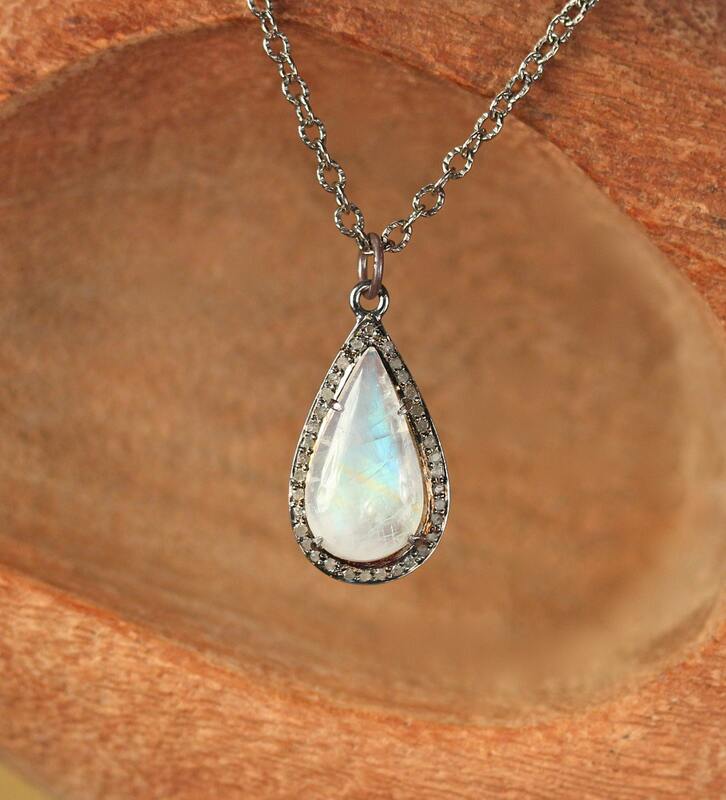 The charm itself is also made of oxidized sterling silver. Please feel free to select a different length chain if you prefer. These gem will be shipped insured. Need a few reasons to love diamonds other than for their beauty? Diamond is a 60th Anniversary gemstone and a precious gemsone. A symbol of purity, the Diamond’s pure white light helps to bring our lives into a cohesive whole. It brings love and clarity into partnerships, bonding relationships. Diamond is a sign of commitment and fidelity, and instills trust to relationships and situations. It inspires the forces of accumulation, attracting the manifestation of abundance. Diamond is an energy amplifier. It is a stone that never requires recharging. It will bring strength and endurance to all energies and will enhance the power of other crystals. However, beware, as this means it will increase negative energy as well as positive! Excellent for blocking electromagnetic stress and for protection against cell phone emanations. Diamond imparts fearlessness, invincibility and fortitude. It clears emotional and mental pain, reducing fear and bringing about new beginnings. Stimulates creativity, inventiveness, imagination and ingenuity. It brings clarity of mind and aids enlightenment. Diamond allows the soul light to shine out. 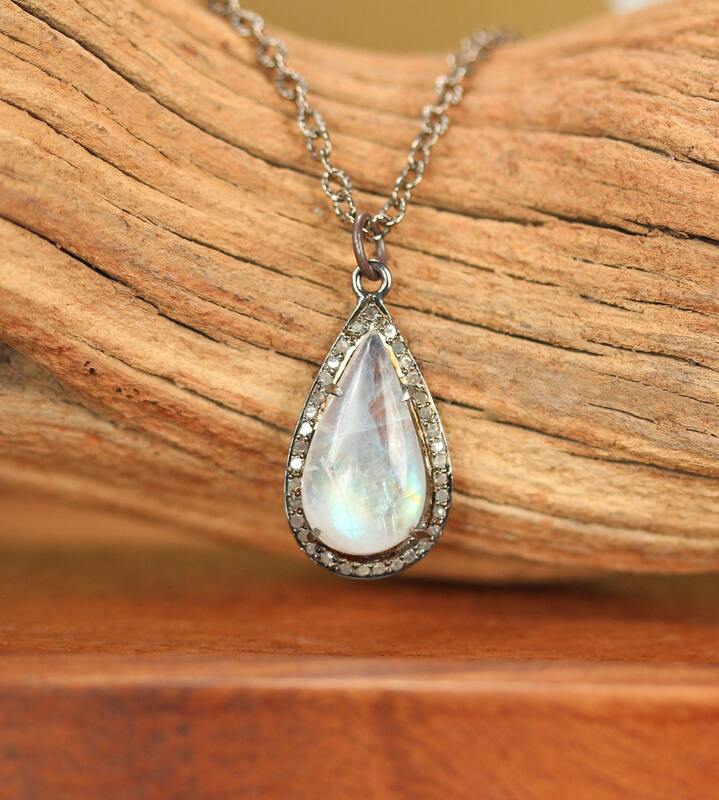 It aids spiritual evolution and reminds you of your soul’s aspirations. 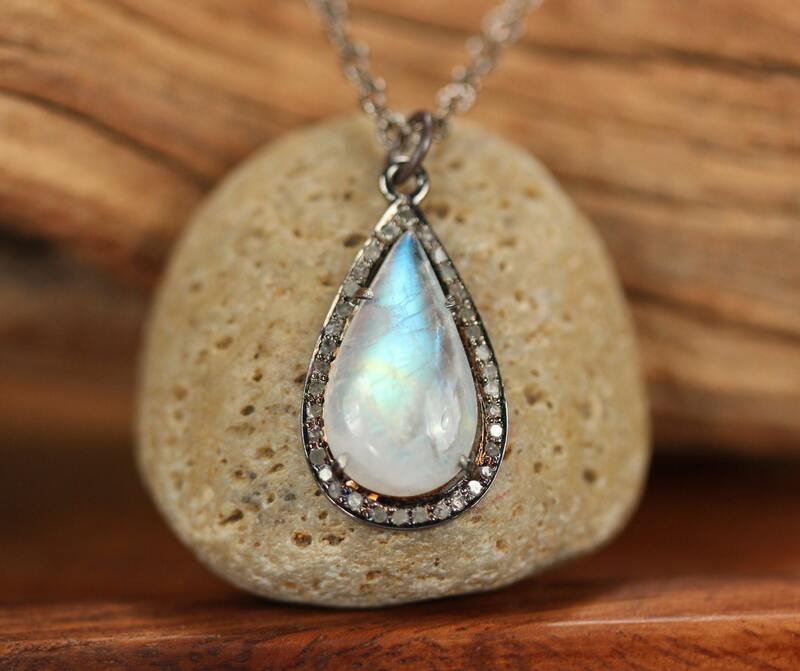 Need a few reasons to love moonstones other than for their beauty? Also! Of course, not all stones come with any negative energy, but since they have most likely been touched by a bunch of people before, I find it best to send them to you pure and perfect.